Thanksgiving is a celebration of gratitude for all the good things in our lives and I know how important it is for all of us to pause and take a moment to acknowledge the things were grateful for. So before we all feast on turkey, stuffing, potatoes and pie lets show our gratefulness for the ability to move our bodies by exercising. Today on GoodDayCarolinas I demoed this pre-Thanksgiving group workout to get your metabolism revved and ready for the feast ahead! So get your tennis shoes on and grab some family members because you’ve got to BURN IT to EARN IT today! This workout is a circuit style format that uses compound movements to burn max calories by challenging your strength and endurance. If you do the workout as written, then you’ll burn 600 calories or more! So get off the couch and get your workout in. You’ll thank me for it later when you feel more energized while socializing with your loved ones and if you don’t over do it with the turkey, you’ll feel great after your big meal too. 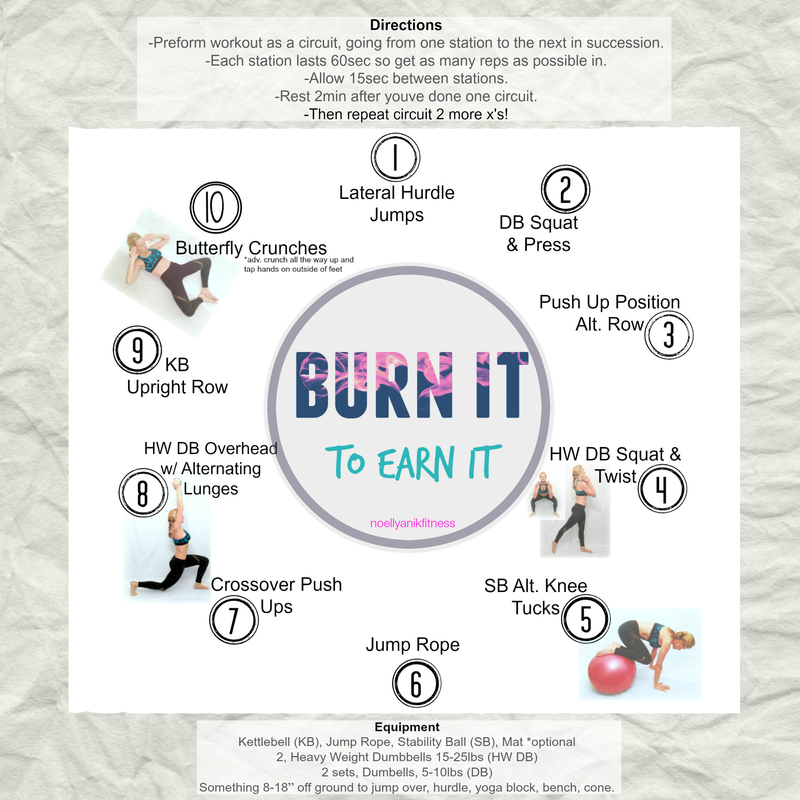 -Preform workout as a circuit, going from one station to the next in succession. -Each station lasts 60sec so get as many reps as possible in. -Rest 2min after youve done one circuit. -Then repeat circuit 2 more x’s! Something 8-18” off ground to jump over, Hurdle, yoga block, bench, cone. If you don’t have access to equipment and still want to get your friends and family together for a fun workout then here’s a great option for you! 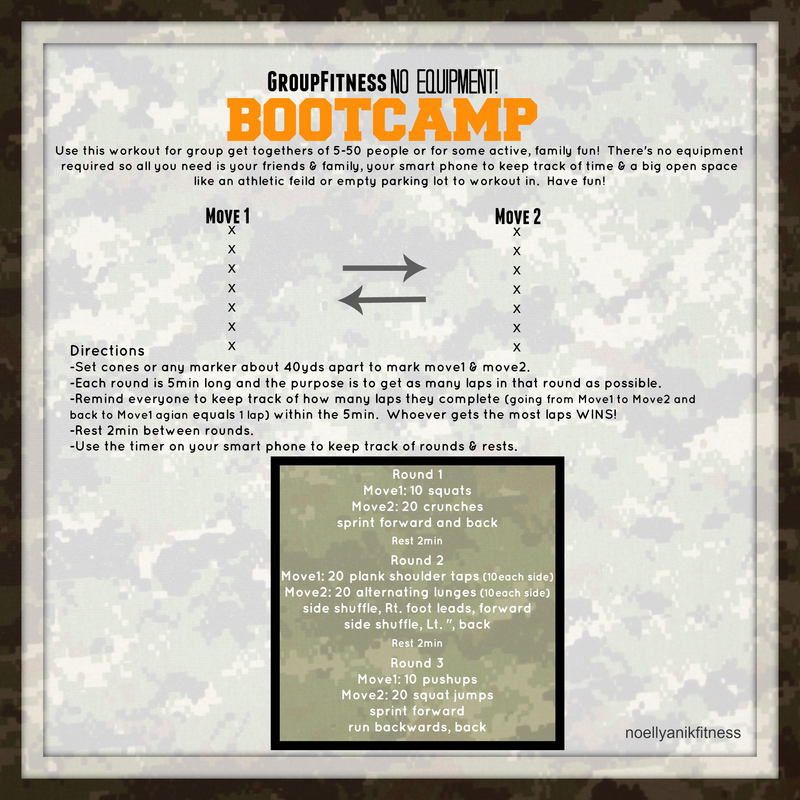 I used this workout for bootcamp many times because its fun and easy for a large group of people to follow. I’ll post a Post Thanksgiving Workout on Friday so be on the lookout for that. Happy Thanksgiving and thank you for all your love and support! You fuel and inspire me to do what I do! Get moving today and gather your friends to join you because anyone can do this workout. Its got basic moves that beginners need to acquire a skill for and advanced people need to revisit these basic moves too. It will take you a maximum of 15min and will rev your metabolism, get you to work up a sweat and make you feel accomplished on this Monday because you’ll be able to say you did 100 squats, 100 crunches & 100 push ups! I finished at 8:13min. Can you beat me? Rounds 1,2 & 5 were my fastest but rounds 3 & 4 weren’t too far behind. The key is to pace yourself. Keep your body tight and stay in good form. Record your time and do this workout 1x a month to track your endurance gains.